Just finished reading The Silver Tide by Jen Williams. This series is so good that it makes me want to cry because it’s now come to an end. Literally, I could cry right now! Enough about me though, to the book with a small cautionary note about spoilers for the first two books in the series. This book is so good, I absolutely loved it. It’s jam packed with so many goodies that I’m sure I developed an ache in my jaw from just gaping ridiculously whilst reading. Not only do we get to return to this fantastic world and spend time with, frankly, three of my most favourite characters from fantasy at the moment, but we go on some totally crazy adventures. Did I mention that there may be gushing – apologies for not forewarning you. At the start of the story the Black Feather Three are going to be enlisted by none other than Devinia the Red. Their mission: to delve, boldly I might say, into the heart of the cursed Island of Euriale (otherwise known as the Island of the Gods) where hopefully heaps of treasure lies waiting for their little grabby hands. Why, you may ask, is this treasure left lying around. Well, nobody who wanders into the jungles of Euriale has ever returned to tell the tale which does put a bit of a damper on any thoughts of going trekking there. Of course our little band of sellswords can’t resist the temptation to line their pockets, plus, let’s just be honest, they’re always keen for a little adventure and at the start of the story all three of them could use a bit of a pick-me-up. Anyway, their latest adventure is going to pick them up in ways they never imagined (not to mention throw them around a good deal and beat the living daylights out of them). Sooner than they know it they’re going to be in a heap of trouble. This book is an unadulterated riot of fantasy. The imagination is just wonderful. We start the story with a disappearance to whet the appetite and give us a feeling for this creepy little island. Is it really haunted by the ghosts of it’s past? Euriale certainly has a long and sad history and it seems that over time the jungle has almost become steeped in bad memories and evil. The Island of the Gods has seen more than it’s fair share of misery and pain. It is also home to the many pirates who make port at the Town of Two Birds, a den of iniquity seething mainly with taverns and brothels. And yet, as rough and tough as these pirates may be, as many brawls as they may boast of and scars they wear with pride – they all know better than to venture over the boundaries of Two Birds. To the characters. Well, if you’ve read the previous two books (The Copper Promise and the Iron Ghost) you’ll already be familiar with Wydrin of Crosshaven, Lord Aaron Frith and Sir Sebastian Caverson. You may also remember Ephemeral who is one of the fearsome brood sisters from the Copper Promise – they’re all going to be making tracks through the jungle. What I forgot to mention of course is that Devinia the Red, scourge of the high seas, is actually Wydrin’s mum – she’s not the kind to be nurse maiding her children and bringing them milk and cookies but she does defy the pirate image a little by being more of a hoarder of books and knowledge than treasure and trinkets. We also become re acquainted with a number of other characters from previous stories but I won’t elaborate on those for fear of spoilers. The plot starts off as a treasure hunt but pretty soon splits into a number of threads as the group become divided. We continue to follow the pirates on their course to the interior of the island. Sebastian goes off on a unexpected and personal mission and Wydrin and Frith become entangled with a group of strange inhabitants, a fanatic cult, who are hatching a plot that could undermine the very fabric of this world. So, what did I love about this book, or for that matter this series. I think Jen Williams has created three characters here that you can really become attached to. It sounds so cliched to say that she brings these characters to life on the page but for me that’s exactly what happens. I have a vision of each of them in my head, I can picture them, how they move, how they talk and I love it when an author manages to do that. On top of that the peripheral characters are also highly entertaining. The writing is great. Swords and sorcery at its most ingenious and entertaining. Plenty of action, tempered with captures, escapes, time travel, dragons, Gods, sea monsters and other huge beasts, magic, dragons (did I already mention the dragons!). Did you entertain me? You most certainly did and you managed to do so consistently over the entire trilogy which is no mean feat. No middle book syndrome to be found here. In terms of criticisms – I have nothing. Although I must say I am sorely disappointed to be leaving this world and these characters behind. I want more, I’m just greedy like that. I think that you could probably read each of these books as a standalone book. I wouldn’t personally suggest you do because I can’t really understand why you would knowingly deny yourself the pleasure of reading the first two books. Just saying. Would I recommend this series. Absolutely without doubt. Do yourself a favour and read them all. I received a copy of The Silver Tide courtesy of the publisher through Netgalley for which my thanks. The above is my own opinion. Now take a look at these lovelies and just imagine them sitting on your shelf! Art it Up. This is a weekly meme hosted by Tabitha over at Not Yet Read. The idea being to see if you can come up with some inspiration for a little sketch or doodle from your last week’s reading or just anything else in general. 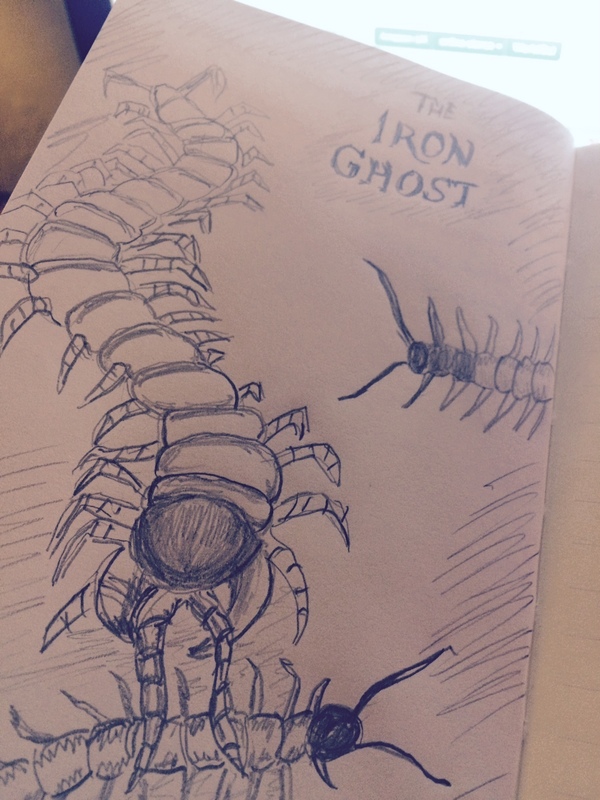 this week I’m reading the wonderful Iron Ghost by Jen Williams. I love this book so far! The diagram is only a tiny sample of one particularly nasty lair that crops up in the story – a nest of giant centipedes and instead of 3 – there’s 3,000! And they need to collect food for their…. no, sorry, no spoilers. Don’t be put off – this is only a tiny part of the story and it is totally gripping – plus Wyverns and Griffins and Wydrin!